B.A. in Theatre Arts Education, Minor in English. Ms. Gabardi was born in Durango, Colorado and raised in Cortez, Colorado. She attended Lewis-Arriola, Cortez Middle School, and Montezuma Cortez High School. Although her family moved a bit when she was younger, they always came back to Cortez. Ms. Gabardi attended Fort Lewis College as a Theatre Performance Major after graduating from Montezuma Cortez High School in 2009. After a year of performance-based study, she began to realize that she loved theatre, but she loved teaching too. Ms. Gabardi transferred to the University of Northern Colorado were she received her Theatre Education Degree, with a minor in English. Ms. Gabardi started her theatre career as a freshman at M-CHS. The production was Cinderella, the directors were Sweetie Marbury and Marla Sitton. Since that production Ms. Gabardi has been constantly working in the world of theatre as an actress, stagemanager, and director. Now she directs with the greatest artists in the world, her students! 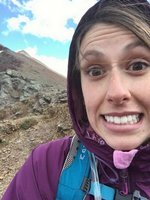 When Ms. Gabardi isn't teaching she is often in the mountains hiking, biking and chasing waterfalls, or at home reading a great new play to her cat, Dexter.